There was a permanent global electrical power blackout. So: Imagine a life without electricity! Revolution takes places 15 years later. There's still no power, but life goes on. People find a way to live. A group is trying find answers about the blackout. What happened and what can they do about it? Revolution has quite some known names! Let's start with Billy burke, who plays the role of Mike Matheson. He just seemed very familiar to me, but I couldn't find out why. Untill, ofcourse, I looked it up at Imdb. Billy also plays Charlie Swan in the Twilight saga (Bella's father). 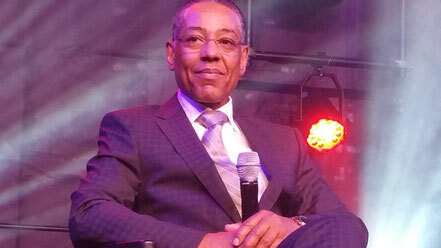 Then, there's Giancarlo Esposito. Most of you will know him as Gus Fring in Breaking Bad. Elizabeth Mitchell is also a big name: She already played a huge role in Lost (as Juliet Burke). What I liked about it was the combination of action with well developed characters. I liked many of the characters in the series, it has a great cast. And most characters get enough screentime to give you some insight in who they are. It's a combination of action, adventure, drama and some sci-fi. Revolution aired from 2012 untill 2014. There were 2 seasons. My favourite character is definitely Tom Neville! Giancarlo does an awesome job in portaying him. Tom Neville is definitely my faourite character in Revolution. But he isn't exactly a good guy. What I love the most: No matter what happens to Tom, he stays calm. And he has this big icy smile. When he smiles like that, he's up to no good. It makes him a really unique bad guy. Hard to fathom. Just seeing Giancarlo Esposito in this role, is enough reason to watch Revolution. It's an interesting storyline which challenges your feelings for good and bad.